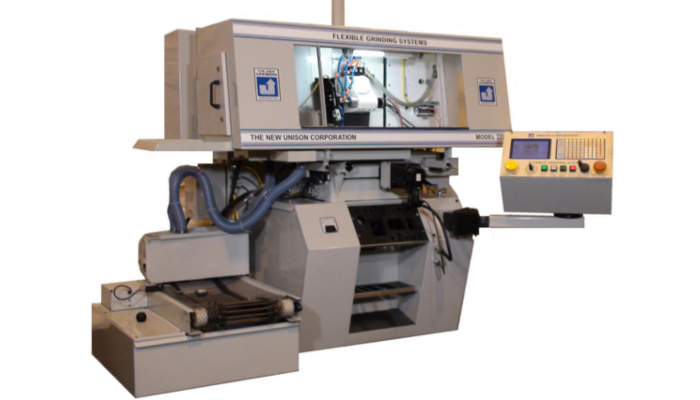 The Model 2000 WDN is a CNC Grinder designed for precise computer-controlled automatic wheel dressing. This machine is ideal for dressing in both conventional and superabrasive grinding wheels. In addition the Model 2000 WDN can be used as a network hub for your Unison Windows™ based CNC grinders for storing and wirelessly retrieving your grinding wheel profile programs. The spindle of each machine is custom-made to fit the taper size of each customer's wheel adaptors so the Model 2000 WDN can be used to automatically dress wheels for any grinding machine. 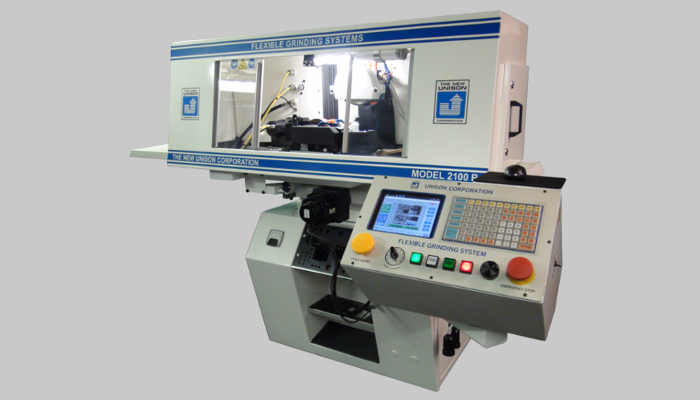 The Model 2000 WDN is also shipped with a complete software package so you can use the machine as an off-line programming station to develop part programs for your Unison Grinders when you are not using it for automatic wheel dressing. The Model 2000 WDN is equipped with our state-of-the-art Unison Programmable Controller (UPC). The Computer Control can store up to 10,000 different grinding wheel profiles and up to 10,000 additional part programs which can be easily be saved or accessed by the operator. 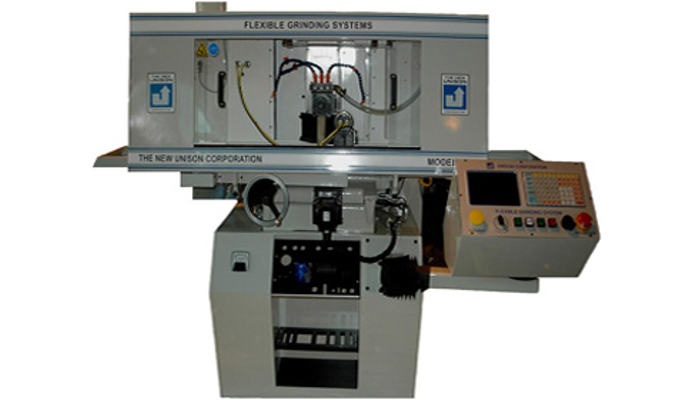 The Model 2000 WDN can be equipped with an optional Wireless Network Hub & Modem so the operator can send grinding wheel profiles and part programs to all of your Windows™ based Unison CNC Grinders. One of the major benefits of using the Model 2000 WDN as a network hub is the reduced potential for operator error when loading wheel profiles and part programs into your Unison grinding machines. Consult our Sales Department about how you can network all of your Unison machines using this machine. The Model 2000 WDN is outfitted with a sheet metal enclosure designed for maximum coolant containment. It has sliding front doors for ease of access as well as for quick part loading and maintenance. The operator's control station features an industrial-grade touch screen color monitor and pushbutton station with keyboard which is conveniently mounted on a right-hand swivel at the operator's work level. The Model 2000 WDN is easy to use and requires only simple inputs using a fill-in-the-blank approach. The machine's base is constructed of metallurgical controlled cast iron, selected for its inherent vibration dampening characteristics and is heavily reinforced to resist bending and torsional twisting forces. 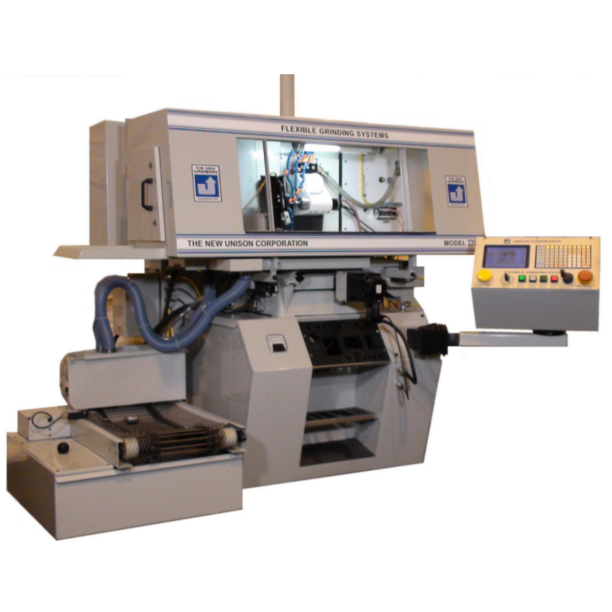 The Model 2150 CNC DedTru is a precision 3-Axis CNC grinding system for centerless OD grinding. All of the DedTru CNC Grinding Systems combine the use of Unison's proprietary software/Machine Control. The Model 2150 combines the use of Unison's proprietary software with our DedTru fixtures allowing the machine to perform throughfeed, infeed, secondary operation, tapers and profile chamfers for cylindrical parts from 0.001 inch to 5 inch diameter. These CNC Grinders are ideal for prepping blanks used in manufacturing of precision cutting tools. Our FGS machines have the capability to dress grinding wheels on the machine with a wide range of dressing options and, as an added benefit, our software automatically compensates as the grinding wheel wears. The software also allows you to dress forms in the grinding wheel using a Single Point Diamond, Dual Point Diamond and/or Electric Roll Dresser. Unison's software is easy to learn and a complete package is installed on every machine which allows our customers to use the Model 2150's for additional applications at a later date without incurring any further software charges. Our software package is highly versatile and includes applications for ID Grinding, ID Profile Grinding, Surface Profile Grinding, Plunge Grinding, Mulitistep Grinding, OD Profile Grinding, Throughfeed Grinding, Standard Surface Grinding and the ability to mix these modes in one cycle start. The Model 2150 is ideal for prepping blanks used in the manufacturing of precision cutting tools. With the introduction of Version 7, Unison Corporation has once again set a new standard in the ease-of-use of software by simplifying the most complex blank geometry. 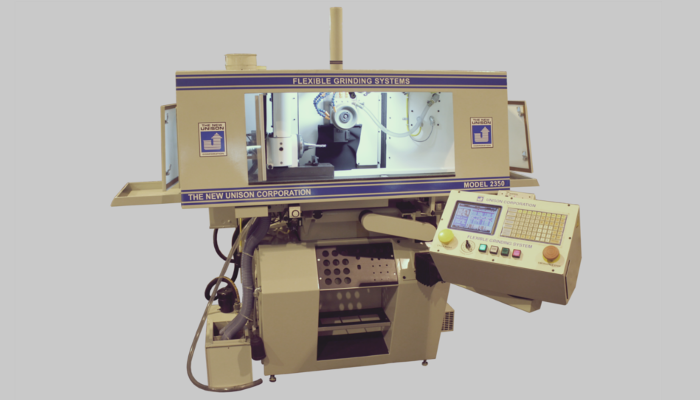 The Model 2250 CNC Flexible Grinding System™ is a 3-Axis ID grinder capable of generating ID profiles. It will rough & finish profile and surface grind ID surfaces for parts with OD's up to 5". High frequency liquid cooled grinding spindles are available from 45,0000 to 150,000 RPM. The Model 2250 utilizes Unison's Parametric Computer Control. The industrial grade color monitor and pushbutton station with keyboard is conveniently located on a right-hand swivel at the operator's work level. Our Model 2250 also includes our latest level Version 7 "Geometral" software which provides greater flexibility. Since the software is designed to operate in the new Windows™ 7™ environment, there is no loss on production time when special programs need to be developed. Simply start another window of the machines software and begin programming your new tools while the machine is running production. The machine incorporates a high definition 3D simulator which permits your operator to actually view the tool produced on the computer monitor before any grinding begins. This 3D simulator offers advanced program verification and allows the operator to detect errors which can cause crashes before they occur. The operator knows exactly what the machine will be doing before it does it. 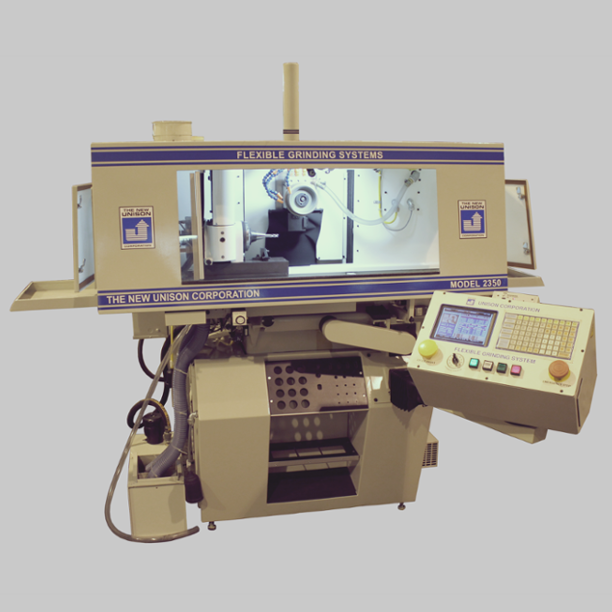 Unison Model 2350 Four-Axis TruCut Grinder is a rigid, but compact, proven version of our Flexible Grinding System™. 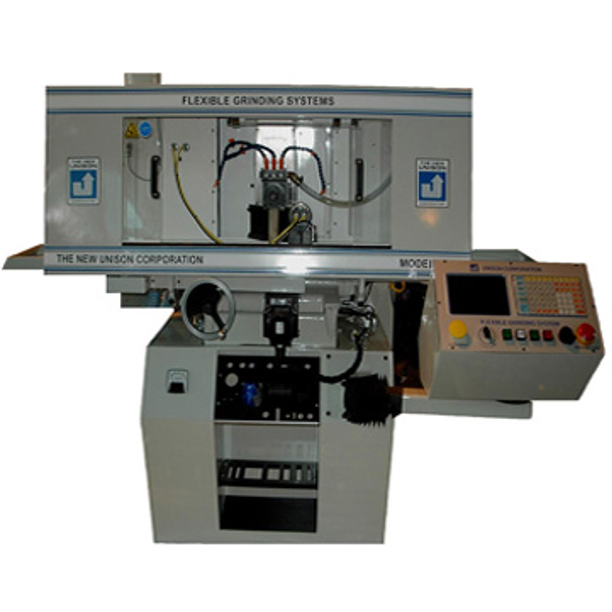 This machine features a fully enclosed work area and is specifically designed for the manufacture of both standard and special cutting tools requiring end grinding and relieving operations. The Unison Model 2350 incorporates years of technological developments currently being utilized on our four and five axes cutter grinders. 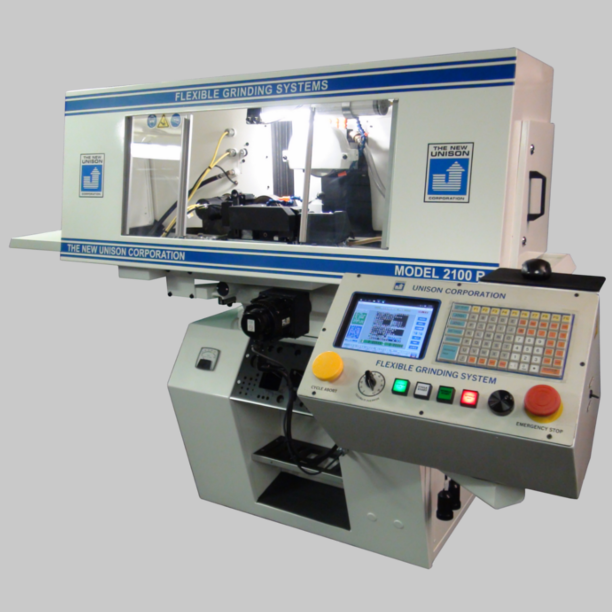 It combines fast cycle time, high precision, reliability and flexible programming systems. The Model 2350 is designed for manufacturing and/or remanufacturing of tools such as endmills. drill points, taps and other carbide and HSS tools. Our TruCut Grinder will grind the side relief and end geometry of endmills as well as the flute face of taps.